friends and family to gather and enjoy the spirit of Italian culture and cuisine – enjoying laughter, exceptional food and each other. Executive Chef and owner, Livio Ferigo, has created a menu with many of his favorite childhood dishes that he enjoyed while growing up in Italy. Café Amici offers a friendly intimate atmosphere with its casual attire and simple, uncomplicated and affordable Italian cuisine. Visit us for a full Italian fare and don’t forget about our Bermuda Cod Fish and Potato Breakfast every Sunday from 9:00 a.m. to 12:00 p.m.
Business or pleasure, visit us for a flavorful and relaxing meal. Located on the corner of the Clock tower Mall, we look forward to serving you. Open 7 days a week. Serving breakfast 9:00 a.m. to 11:00 a.m. and lunch to 4:00 p.m. Open for dinner 6:00 p.m. to 9:00 p.m. Call 234-5009 to enjoy your Italian dining experience. 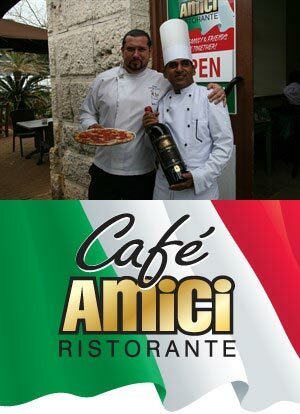 Café Amici – where friends and family come together! Buon Appetito!